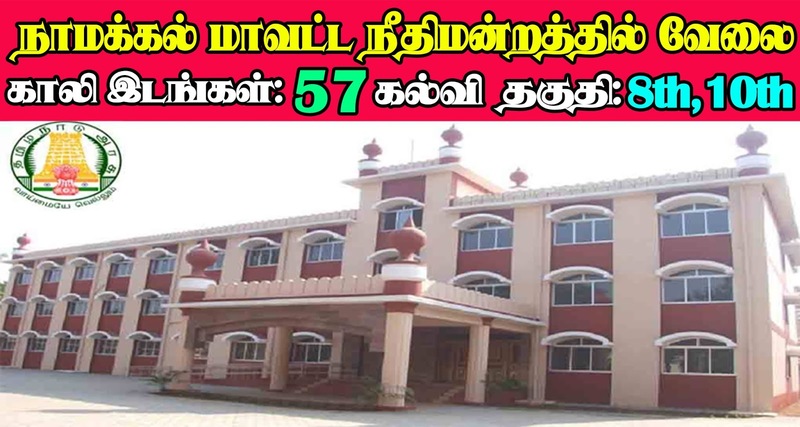 Namakkal District Court Recruitment 2019 - Namakkal District Court invites applications for recruitment of 57 Computer Operator, Senior Bailiff, Junior Bailiff, Driver, Xerox Machine Operator, Office Assistant, Masalchi, Night Watchman, Sweeper & Sanitary Worker Posts. The applicants are requested to Download Application Form through Official Website http://www.districts.ecourts.gov.in/tn/namakkal. The last date for the receipt of application along with enclosures is 29.04.2019. Interested candidates are requested to peruse the advertisement regarding the process of Examinations and Interview, Eligibility Criteria, Application Fee, How to Apply, Pattern of Examination, Syllabus, Question Paper, Admit Date, Exam Date, Result Date etc,. Refer thoroughly before applying. Educational Qualification: A pass in Bachelor's Degree in Computer Science/Computer Applications from a recognized University of Indian Union or a Bachelor's degree in B.A., or B.Sc., or B.Com., from a recognized University of Indian Union with a Diploma in Computer Applications from a recognized University. Applications with passport size photo affixed and duly signed on the right margin of the application in the space provided as mentioned should be submitted along with self attested copies of all the testimonials, certificates by the Registered post only on or before 29.04.2019, til l 06:00 P.M. to the undermentioned address.